Everyone knew the riots were coming — or at least, that was what it felt like. Predictions of an “explosion” of popular anger in Jordan had been hanging in the air for a while, and when a new set of austerity measures this month brought street protests and violence, it was hard not to see them as the inevitable outcome of the Arab Spring. But November’s storm passed almost as quickly as it came: The clashes between police and demonstrators simmered down, the daily protests died away and Jordan’s political opposition movements were left wondering why this moment of crisis was so far from transformative. By early November, opposition leaders were fed up. They had taken to the streets in earnest in early 2011, as the Arab Spring was shaking the foundations of the region’s entrenched regimes, and had stayed there ever since, demanding political and economic reform. Two years of street protests had followed the mass-movement tactics made familiar in Egypt and Tunisia: Gather as many people as you can at a central or strategic location, and demand that the state change or get out of the way. In Jordan, that didn’t get very far. Jordan has been peaceful and stable for decades, while many of its neighbors were not, and it was always a given that Jordanians, as a whole, valued that stability. Too much unrest would turn people against the protest movement, not least because Jordan is a society divided along national and politico-religious lines. A group that could be accused of fomenting unrest could find itself quickly isolated. So the big demonstrations were so safe and peaceful as to be almost soporific. Participants were careful to be clear that they were asking for reform, not regime change. A few protests got more aggressive, but they had trouble drawing supporters, and were easily shut down by Jordan’s security services — which carefully avoided making the kind of bloody mistakes that rallied the populace against the regimes in Syria and Egypt. The state, in turn, responded to protests with its own reform program: The government pushed through new elections and political parties, the king made changes to a chunk of the constitution, and he claimed this would pave the way to a popularly-elected government. But the big changes that the opposition wanted — a representative parliament, a serious anti-corruption campaign, a move away from neoliberal economic policies, a firewall to keep the intelligence services out of domestic politics — seemed as far off as ever. What the opposition did get was a series of placatory moves, as the king appointed then sacked one unpopular and ineffective government after another. At the same time, there were numerous crackdowns on activists, who were arrested and charged by military courts. Opposition leaders can point to a number of achievements in that period, chief of them being the opening of a much broader public space for dissenting speech. But their political demands were not being met. Again and again in interviews I would hear the refrain, “We don’t believe this government is serious about reform.” In fact, Jordan’s state has a history of promising democratization and then reneging, which goes back decades. If it is serious about the reforms that began in 2011, it has failed to build the trust that would make people believe it. By November, it was easy to feel frustration in the air. The opposition was tired of waiting for the state to offer a better deal. Some, perhaps, thought the time had come for an explosion. As this political struggle was playing out, Jordan’s economic situation was getting worse. The combination of a bloated government budget and regional unrest was pushing the country toward an unprecedented fiscal crisis. The state had been trying to cool unrest with subsidies and promises of jobs, but time was running out on that strategy. When the government started talking about phasing out the subsidies on fuel, a measure that would hit ordinary Jordanians hard in the pocketbook, the coming storm got a name and a face. On Tuesday, November 13, the Islamist party under-secretary told me that much of his party’s strategy was simply to watch and wait: The government’s economic path was so disastrous that the opposition didn’t need to do anything. The people were suffering and wouldn’t take it much longer; the state would have to change course or risk an explosion of popular anger. It didn’t take a weatherman. Hours later, as I was transcribing that interview, the government announced its new austerity measures on the evening newscast; the price of heating gas went up 55 percent, and the streets filled up with crowds demanding the fall of the regime. Out in the countryside, there were fires and rumors of gun battles. Papers reported mobs burning police stations and government buildings. The news media said the state might really collapse this time — but they’ve said that during every crisis since 1951. Wednesday was worse: A young man was killed up in Irbid, no one knows quite how. The police described him as a gunman making an armed assault on a police station; his family said he was a peaceful protester. 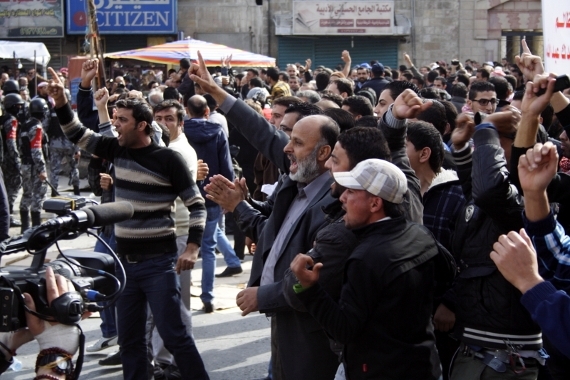 In Amman, opposition demonstrators gathered in a traffic circle in the commercial neighborhood of Jabal Hussein, planning to march to the Interior Ministry. 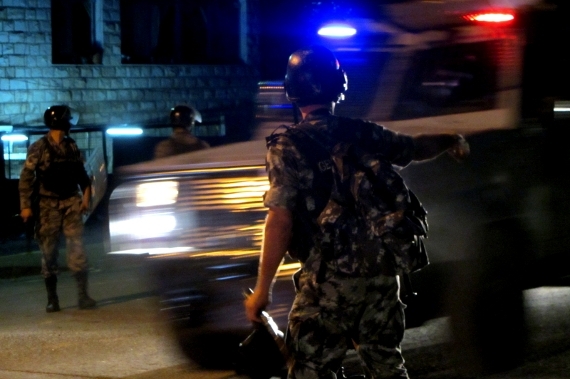 Jordan’s riot police, the darak, stopped them with tear gas. In the coming days, police and protesters would each claim the other group had planned and instigated the violence for political ends, but at the time it just looked like a riot; news agencies ran video of young men throwing stones and setting fires in the street, of police hitting crowds with gas and water cannons. By Thursday evening, there had been more than 150 arrests. The opposition — especially the Muslim Brotherhood — came out swinging: Wasn’t this what they had predicted all along? Brotherhood leader Zaki Bani Irsheid made the rounds of the major press outlets, saying that the real explosion was still to come, that ordinary Jordanians would fill the streets. He told Agence France-Presse, “The regime must reform before it is too late.” Here it was, after all: the moment when the opposition seemed to have some leverage. A crisis that could be an opportunity for whoever seized it. But he couldn’t have it both ways. The state was already seizing the opportunity itself, saying the Brotherhood had masterminded and engineered the protests, in order to create political leverage. “This was not spontaneous,” an unnamed “government security official” told The Washington Post on November 14: “The Muslim Brotherhood had a plan, and they were well organized. For them, it is a gift from heaven.” On November 15, the partially state-owned Jordan Times reported that the Brotherhood had offered to calm the protests if the government would finally accede to its political demands. The Brotherhood tried to hit back, but the idea that the Islamists were encouraging unrest had already taken hold — even among some other opposition parties, who blamed the Brotherhood for not supporting them in the street because they were pushing for a back-room deal with the state. It was an easy accusation to make, since the Islamists have a reputation for selling out their gains at the bargaining table. Activists from other movements also appeared to fall victim to the fever of unrest, the sense that their moment had finally arrived. On Thursday, the third day of the crisis, I went to Feras Circle, the center of the neighborhood where riots had raged the night before. Some young organizers had called for another protest there, again planning to march to the Interior Ministry; the government had said the Ministry was off-limits, and surrounded it with police and darak. I arrived expecting to find the “ghost town” that the morning’s news report had described, but didn’t see so much as a broken window. The shops were all open, there were couples shopping and families out for walks. Shopkeepers stood in the doorways, drinking coffee and talking. Perhaps there was tension in the air, the expectation of another night of violence — or perhaps it was just in my head. There were no protesters in sight, either. The whole enterprise had a cloak-and-dagger air, organized in semi-secret over cell phones and Twitter. When it happened, it all happened at once. A group of young men came running into the circle out of the street that led to the Interior Ministry Circle, where the darak were posted. Some people panicked and ran with them; others watched, puzzled. Shopkeepers began calmly lowering their steel shutters. Another group of young men materialized out of nowhere in the center of the circle; they managed about 15 seconds of shouting “The people want the fall of the regime” before the riot squads moved in, firing tear gas and chasing them down side streets. I ran away with everyone else. Whatever one might say about the goals of this police action, it was effective. The darak were there to keep protests away from the Ministry and to prevent a large group from gathering that could march there and force a confrontation. They did both without much trouble. I didn’t see anyone hit or roughed up; any group of more than five young men was scattered with feint-charges or tear gas. By the time I made my way back through the side streets to the circle, many of the shops were open again, as well as the roads, and residents and pedestrians were going back to their shopping, walking through the lines of armored darak. I had worried that taking pictures would get me detained, but it was the opposite: Once I brought my camera out and started filming, they ignored me completely. I found myself wondering what this protest was meant to accomplish; I tried to see it through the eyes of the participants. They believed the nation was with them — it had just been cowed, beaten down with nightsticks and tear gas. They were out here keeping the chants alive, so everyone could see that mere force would not defeat them. They were holding up the cause, waiting for the moment when the country would rally behind them, and they could march to the houses of power to demand change. My own eyes were more jaded. The country was not watching; the country was home in bed. As soon as one allowed the possibility that these young activists might not really represent “the people,” much of the evening’s activity took on an uncomfortable color of thrill-seeking. It felt like the end of something. There were a few more spasms over the next few days, but the “popular uprising” simply faded away. November brought hard lessons for Jordan’s opposition. The economic hammer fell, and the people did not rise up. There are many reasons for this, but the one I always come back to is the deep appeal of security in a region where everyone can see exactly how bad things can get when governments fall. In late October, the Center for Strategic Studies, which is pretty much Jordan’s only reputable and respected pollster, did a national survey that asked about the protests. The results have not been released yet, but the head of the center’s polling unit, Walid Alkhatib, related to me some of the findings. When asked if the state’s reforms had gone far enough, the country was deeply divided. There was clearly a large constituency that agreed with at least some of the protesters’ demands. But when people were asked if opposition movements should demonstrate in the streets, or stand for election and try to make change from within the government, an overwhelming majority said they should stand for elections. Unrest is just too unpopular. It’s too early to tell how severe the backlash over November’s events will be, but it seems certain there will be one. Have the riots driven more people away from protests than the price increases have drawn in? Some activists seem to be taking a lesson from what happened, trying to transform themselves from an opposition to a popular movement. As I write, there are rumors of a schism within the Muslim Brotherhood, a re-ordering that may change how the group engages with reform in the coming year. Two days after going to Jabal Hussein, I observed another protest, this one in the low-income neighborhood of Ashrafiyeh. About 50 opposition activists gathered in front of a large mosque — choosing a spot near Jordan’s largest public hospital, so the darak could not close off the streets. But this protest wasn’t targeting official buildings, and the security services didn’t even show up. For about an hour, demonstrators marched in through the neighborhood back streets, singing songs and chanting. Some of the chants were aggressive by Jordanian standards, but I did not hear any calls for the downfall of the regime. At one point, as we walked down a steep hill lined with bleak concrete apartment blocks, I asked one of the organizers, Mothanna Gharaibeh, about a chant I didn’t quite understand. “We are with the police forces, and we are one hand and we are united,” he said. “We are all poor together.” People from the neighborhood watched from apartment windows and came out of shops to see the marchers pass. In front of a bakery, a little girl stood with her father; he was glaring at the crowd, but she was smiling and clapping along with the song they were singing. At various points, several hundred local youths came out to join the procession. The organizers ran herd, hurrying people across streets and guiding them on routes where they would not block traffic. This approach in itself seemed almost revolutionary. Rather than standing outside a government building, waiting for the street to rise up, activists went to the street and tried to engage it. Gharaibeh says his next project will be focused on information-gathering: finding out what issues really mobilize Jordanians, particularly those in the communities hit hardest by the country’s failing economy. To be effective, he says, an opposition has to be in tune with what people want, not what a few leaders think they want. Whether these kinds of efforts can build the appeal of the opposition movement is anyone’s guess. And large protests may still play a role. The Islamists have called for a mass rally on Friday, in response to a new wave of arrests this week. But with elections scheduled for January 23, there is little time for the opposition to reinvent itself or build new coalitions. The voting will be in essence a referendum on whether Jordanians are willing to give the state’s reform program more time to work, or whether they think it’s inadequate. Either way, there will be discontent, frustration, and rumors of conspiracies and back-room deals. Once again, everyone knows the crisis is coming. The question is how will they prepare for it, and when it comes, how will they react. Nicholas Seeley is a freelance reporter who has lived in Jordan since 2004. From 2005 to 2010, he was an editor at Jordan's leading current affairs magazine, JO. He continues to write about Jordan for a number of international publications, and he hopes it will all turn out all right. Follow him on Twitter @nicholas_seeley. Good intel. Reminds me of the USA, where most want peace and quiet no matter the cost or long-term harm. Give up on principles so long as food and shelter are OK. In the USA, my fellow citizens are what need changing first, and it’s going to be extraordinarily difficult to dislodge them from their entrenched and secure stupor. Addendum: Just got back from Friday’s protests: thousands marched from Amman Mosques to the Feras Circle, perhaps 5,000, could be even more. Not the biggest demonstration in Jordan, but not insignifican. The march had been intended to go to the Interior Ministry Circle, but the police and darak had once again closed off the streets; after a few fiery speeches, the protesters dispersed peacefully. Whether this will make any waves with the state is anyone’s guess, but it does show that, while the MB in particular may have suffered some credibility loss after this month’s violence, the organized protest movement is anything but broken.